In June we have a gorgeous 4 tier iced floral cascade to deliver to The Lawn, Rochford, Essex for Debbie and Peter’s big day; in fact there are quite a few sugar flowers bouncing around the Sticky Fingers Cake Co order book this year (very exciting)! So before the wedding season really kicks in, it’s time for me to knuckle down and start preparing all the beautiful flowers that will adorn the wedding cakes this year. 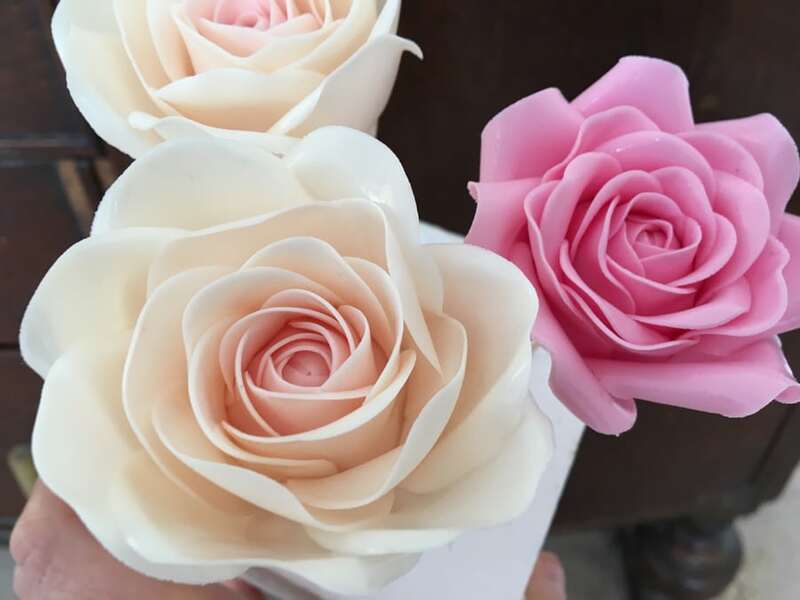 Today I started on some sugar roses of two different shades of pink, one similar to the “Aqua” rose which is what I call a kind of Barbie pink, and also a gorgeous pale pink/cream rose. These were chosen by Debbie as they are what she’s carrying in her bridal bouquet. I will also be making some blue cornflowers for the cascade, to match Peter’s suit. Sounds like it’s going to be a fabulous wedding!